BadgeBox also offer a possibility to manage employees’ requests, whether we are talking about sick leave, holidays or a time-off. The administrator can visualize all incoming request in real time and decide whether or not to approve them. In the section “Company” it is possible to establish an approval process by adding different levels of approval where all or at least one member needs to approve a request. Once a request is being approved by a certain level it passes to the next one and so on until the last level of approval. It is important to say that a request cannot pass to the next level of approval, until being approved by the previous level. After a request is being approved or rejected, a notification is being sent to an employee in order to inform him. 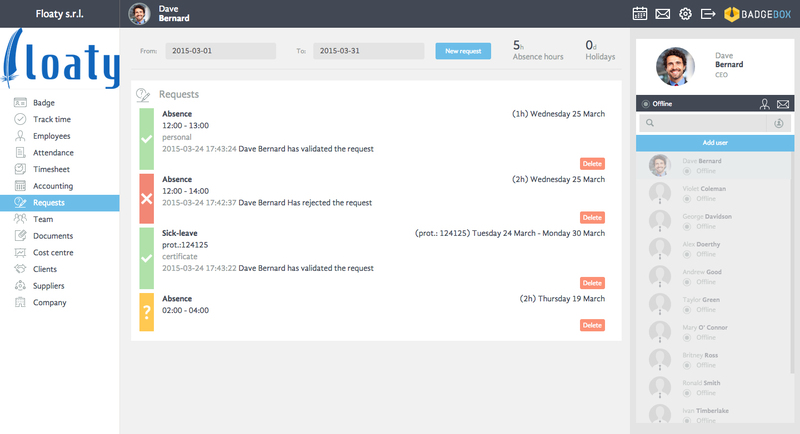 An Overview visualization allows the administrator, and all other users with the right permissions, to see in one place all request made for a selected period of time. This allows a better request management offering all required information at one place. In this case the process of request management is automated and simplified which results with lower costs and more time to focus on core business. On the other hand, each employee can visualize in this section the amount of entitled, submitted and pending time-off, as well as the total amount of time-off available. It can also visualize the total work absence and entitled, required and available number of holidays.